This chameleon was discovered in the foliage at the camp by a member of the camp staff. They pointed it out to our guide, who pointed it out to me, who had been pestering our guide about chameleons at every free moment. Remarkably, the camp guards were quite frightened of this entertaining little lizard. They would let me take photos but they shouted warnings when I leaned too close. One of them said it would spit poison. Maybe that's what it's preparing for in the second photo? 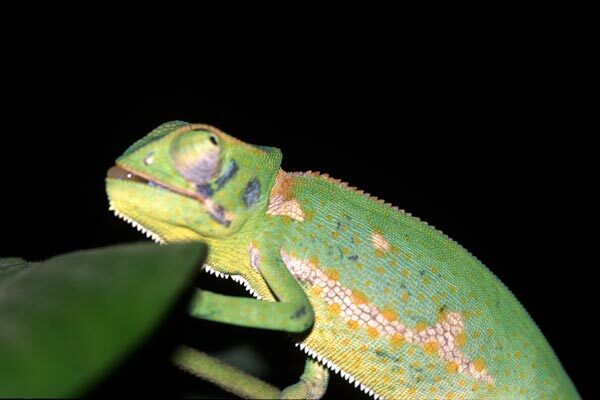 Many thanks to Dr. Robert Drewes for identifying this chameleon. 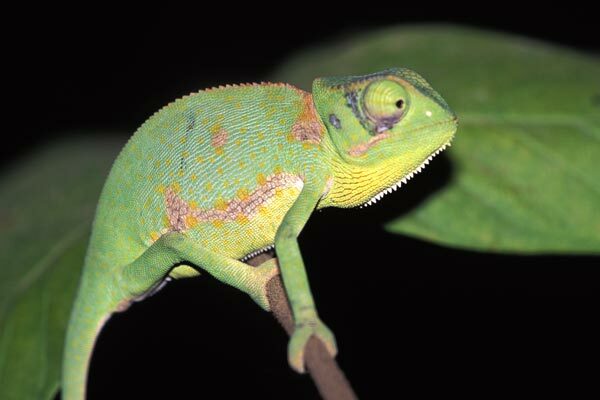 Petr Necas, author of Chameleons: Nature's Hidden Jewels, wrote to me with his belief that this chameleon is a juvenile of a different species, Chamaeleo quilensis. It's impossible to be completely sure from a couple of photographs, since the two species in question look very similar.